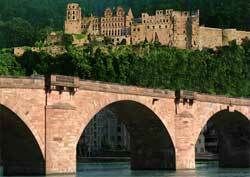 Heidelberg is one of the leading tourism destinations of Germany. It has a picturesque castle, a fascinating old town, and a renowned academic culture.zHeidelberg is one of the leading tourism destinations of Germany. It has a picturesque castle, a fascinating old town, and a renowned academic culture. The 14th century Heidelberg Castle (see photo) is mainly ruins, but rewarding to explore. You can walk up to it or take the funicular. Heidelberg Castle has the world's largest wine vat (holds the equivalent of more than 200,000 liter bottles). The terraces offer nice views of the Old Town below. The Old Town has cobbled streets quaintly lined with centuries-old half-timbered buildings. Its Old Bridge has a stunning gate. Heidelberg is a brainy town, with a highly respected six-century-old university and a number of acclaimed German scientific research institutes. Be sure to visit the free-spirited old student quarter, especially at night. Youthful romance in Heidelberg is immortalized in many German songs, including in Sigmund Romberg's famous operetta, the Student Prince. The best views of the castle and Old Town is from Philosopher's Walk on the other side of the river.